Parts of the metropolitan area that got snow Friday saw only a dusting. Most people in the area can expect more than that Saturday. There is a good chance of a dusting to an inch of snow beginning overnight. There could be more north of D.C., with up to 2 inches possible in Baltimore, and on the Eastern Shore. Though that's not a lot of accumulation, the cold weather means it will stick, so be careful driving area roads and walking along area streets Saturday. Even more snow is possible Tuesday. 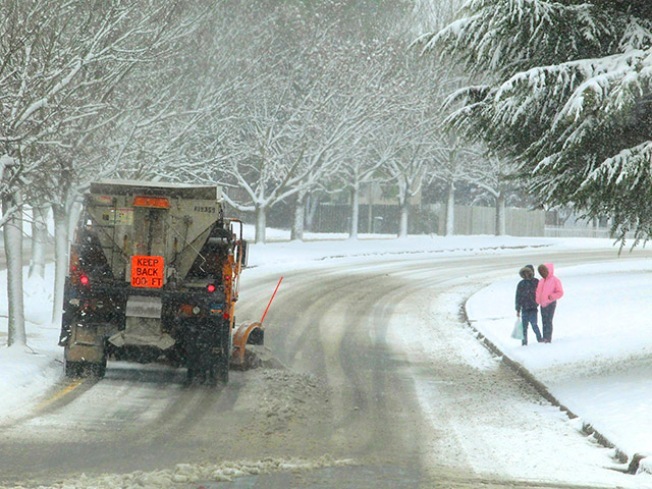 The Washington region has already seen one major snowstorm pass just north of the area this winter, and a weaker storm just missed us again early Friday. NBC Washington meteorologist Tom Kierein said that all it would have taken was a shift in upper-level winds by 50 to 100 miles to bring heavier snow to our region this morning instead of the dusting that most of the area received. So how does it work? Upper-level winds steer storms, and based on the speed and movement of the upper-level winds, we've had some close calls -- but no heavy snow. The storm system that passed to our north Friday morning gave us a brief burst of snow predawn. That laid down a dusting -- enough for some school delays in Howard and Frederick counties in Maryland and in parts of West Virginia. That same storm system headed toward New York, Hartford, Providence and Boston. There could be flight delays there, as the storm will intensify as it moves northeast. "Eventually our luck will run out," Kierein said. "It's only a matter of time that we'll eventually have a direct impact of a snowstorm here." So when will snow lovers be able to rejoice? Well, a dusting to an inch of snowfall is possible overnight and into Saturday, but heavier stuff may be just around the corner. Check back on News4 and NBCWashington.com for updates to Tuesday's forecast.